While you browse in File Explorer, you can open each drive, folder, and library in the same window or in its own new window. This tutorial will show you different ways on how to open each drive, folder, or library in the same or new window for your account in Windows 10. 1. Open File Explorer (Win+X). In Windows 10 build 17639, this will open the folder in a new tab instead if Tabs in apps (Sets) is turned on. 1. Press the Ctrl+N keys to open the currently opened folder, drive, or library in a new window. A) Click/tap on Open new window. B) Click/tap on the arrow to the right of Open new window, and click/tap on either Open new window or Open new window in new process. 1. While in File Explorer, select one or more folders, libraries, and/or drives. Press and hold the Shift key, click/tap on Open in the ribbon, and release the Shift key. Press and hold the Ctrl key, click/tap on Open in the ribbon, and release the Ctrl key. In Windows 10 build 17639, this will open the folder in a new tab instead if Tabs in apps (Sets) is turned on. If you select more than one folder, library, and/or drive, then this will open each item in its own new window. Shift will open the item how you have it set to do so in Option Four or Option Five below. Ctrl will open the item the opposite of how you have it set to do so in Option Five or Option Six below. In Windows 10 build 17639, this will open the folder in a new tab instead if Tabs in apps (Sets) is turned on. 1. 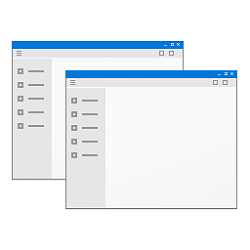 Open Folder Options (aka: File Explorer Options). 4. Do step 5 (same) or step 6 (new) below for what you want. 7. You can now close Registry Editor if you like. While viewing the set of icons on my Desktop - many of which are folders - I can open any folder using File Explorer. BUT when I open a 2nd folder - the 2nd folder always opens in a separate window. Furthermore, if I click on a 3rd Desktop folder icon - File Explorer opens a 3rd separate window. And so forth. I followed your procedure(s) to "Open Each Folder in the Same Window in Windows 10" - and it works perfectly in all cases, except when opening folders using the icons on my Desktop. I thought that the registry was possibly corrupted - so I reinstalled the Windows 10 Pro from scratch. I checked the File Explorer folder browsing options and verified that the option was set to "open each folder in the same window". BUT once again - whenever I use icons on my Desktop to open folders - File Explorer always opens each folder in its "own" separate window. I would like to open a series of Desktop folders - and have each sequential folder being opened, to have its contents overwrite the prior folder's contents being displayed in the one single window. Do you know how to make "File Explorer" use the same window when opening Desktop folder icons? "Open each folder in the same window" only applies when you are opening folders in the same File Explorer window. When you click on a folder icon on your desktop, that is considered to be different that your other currently opened File Explorer windows, so it will open the folder from your desktop in a new window. This is normal behavior. As a workaround, you could turn on "Show all folders" in the navigation pane of File Explorer. Afterwards, you should see all the folders (not shortcuts though) on your desktop at the bottom of the tree chart in the navigation pane like below to click on and have them open in that same window. You're most welcome rwgarre, and Happy New Year.